Forest is about 25 miles north of Atlantic City and six miles west of Tuckerton. Take the Garden State Parkway to exit 52 heading south and exit 50 heading north. The Bass River State Forest recreational facilities are partially accessible for persons with disabilities. Please contact the park office for further information regarding disability access needs. Text telephone (TT) users, call the New Jersey Relay Service at (800) 852-7899. Be advised that tree work is planned along Stage Road near the Bass River State Forest office January 15 through 17 around the hours of 9 am – 3 pm. Brief lane closures may be necessary at times but we do not expect the road to be closed. Fishing is subject to New Jersey's Fish and Wildlife Laws. Freshwater species are mainly pickerel, sunfish, and catfish. Fishing License are available nearby. NOTE: The beach is closed to vehicles May 15 - September 15. The Civilian Conservation Corps was created during President Franklin D. Roosevelt's "The Hundred Days," the beginning of FDR's first term, and a time of massive legislative efforts to deal with the paralyzing effects of the Great Depression. The CCC put needy young men to work and sent a large portion of their pay back to their families. The fact that only 37 days elapsed between FDR's swearing in and the induction of the first CCC enrollee on April 7, 1933 reflects the importance of this program. By the time the program ended in 1942, due to World War II, over three million unemployed young men had been enrolled, planting over three billion trees and completing many other conservation projects including building much of the infrastructure at Bass River State Forest. The CCC camp at Bass River State Forest, Camp S-55, lasted from 1933 to 1942, throughout the entire life of CCC. Company 225 served at the camp from 1933-1937 and Company 2201-V, a Veteran’s company, followed from 1937-1942. There were usually 200 men at the camp, which was a full complement. The CCC members performed wide range of conservation work. The young men of the CCC built park roads, trails, bridle paths, bridges for vehicles, ponds for fish and waterfowl, lookout towers, nature observatory shelters, picnic areas, cabins, fireplaces, campgrounds, recreational lakes, and landscaping. The most noteworthy feat was the creation of the 67-acre Lake Absegami, by damming two streams flowing through the forest. The foundations of Camp S-55 and the CCC Memorial are part of a self-guided trail. Brochures are available at the Forest Office and at the beginning of the trail near the parking lot on East Greenbush Road. 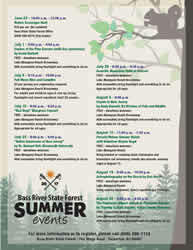 Stop in at the Forest Office to see artifacts from our Camp as well as a list of members from our Camp. Check to see if your family member or relative was a CCC Camp s-55 member at Bass River between 1933 and 1942. If you know of anybody whose name should be on the list please let us know by contacting Cynthia Coritz, Superintendent at Bass River state Forest. A self guided nature trail loops through this wetland forest, where Atlantic white cedars share the canopy with red maple and magnolia. The Pinelands white cedar swamp and surrounding oak-pine forest community make up the Absegami Natural Area. This unique stunted forest ecosystem, known locally as the Pygmy Forest, is globally rare and supports an extensive forest of pine and oak trees that may obtain a canopy height of only four feet at maturity. New Jersey contains the largest acreage of this forest community type worldwide. The area also supports an endangered plant species - the broom crowberry - and numerous rare species of moths. 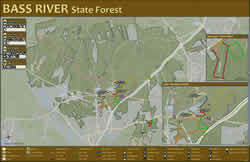 Bass River State Forest has eight easy walking (non-ADA accessible) trails from 1 to 3.2 miles. The 1/2 mile self-guided Absegami Trail includes a wooden foot bridge with benches. All trails start at the second parking lot at the beach. Animals, birds and plant life of the Pine Barrens may be found. A trail brochure is available at the office, or on the portion of the Orange Trail that passes through the old Civilian Conservation Corps camp near East Greenbush Road. This guide describes the camp foundations. 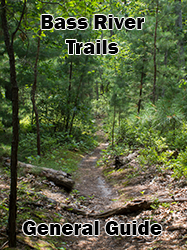 This easy walking trail, well marked with pink blazes, runs for 50 miles through Bass River State Forest, Wharton State Forest and Brendan T. Byrne State Forest, crossing streams and passing through forested areas that were once bustling towns with names such as Four Mile, Butler, Martha and Washington. This portion of the Batona Trail is maintained by the NJ State Park Service, Outdoor Club of South Jersey and the Batona Hiking Club. Pet Friendly Campsites please click here for details on sites that are designated Pet Friendly, license and innoculation paperwork requirements and additional cost. Pet friendly sites are 1-85. Campsites: 176 tent and trailer sites with fire rings and picnic tables. Flush toilets, showers and laundry facilities are within walking distance of all sites. No hook-ups provided. Each site accommodates a maximum of six campers, two vehicles (including trailers) and two tents. Trailer sanitary station is open March 1 through November 30. Open year round. Fee: NJ Resident $20 per night; Non Resident $25 per night. Group Campsites: Six group campsites with water and pit toilets are within walking distance. Each site accommodates a maximum of 25 campers. Parking is directly on the site. Open year round. Fee: NJ Resident: $50 per night; Non Resident $100 per night. Six licensed vehicles only are permitted to park on each group campsite, within the campsite limit signs. Additional vehicles are required to pay $5.00 per night and park in the designated parking area. Lean-tos: Nine handicap accessible lean-tos each with a hardwood floor and a woodburning stove. Outdoor picnic table, fire ring and grill. Flush toilets, showers, and laundry facilities are within walking distance. Located on the south shore. Accommodates a maximum of six people. Open year round. Fee: NJ Residents: $35 per night; Non Residents: $40 per night. Shelters: Six lakeside shelters with two bunk rooms, one double-deck bunk in each room, a living room with a picnic table and bench, woodburning stove, fire ring and screened double door. Outdoor grill for cooking, table and benches. Flush toilets and shower facilities are nearby. Shelters are located along the north shore of Lake Absegami. Accommodates a maximum of four people. Open April 1 through October 31. Fees: NJ Residents: $48 per night; Non Residents: $60 per night. Cabins: Six lakefront cabins with living room with double-deck bunk and fireplace; two bunk rooms with double-deck bunks; kitchen with running water, electric stove, refrigerator; bathroom with shower, toilet, and sink. Screened-in porch faces lake. Outdoor fire rings. Electricity. Each accommodates a maximum of six people. Cabins are located along the north shore of Lake Absegami. Open April 1 through October 31. Fees: NJ Residents: $75 per night; $525 per week; Non Residents: $85 per night; $595 per week. 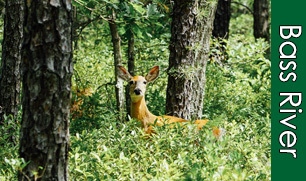 Hunting is allowed in large parts of the forest and is subject to New Jersey's Fish and Wildlife Laws. Game found in the forest include deer, rabbit, and grouse. Contact the forest office for further details. Located near the beach are 74 picnic tables with charcoal grills, a picnic shelter, restrooms, athletic field for games and playground. Pets are permitted at the picnic area on a six foot leash. Alcoholic beverages are prohibited. Non-Resident $65 per day, plus applicable parking fees. A public boat launch is located north of the recreational area parking lot. Powered boats are limited to electric motors only. A canoe, kayak, rowboat concession is operated during the summer months. Coast guard approved life preservers are required. Swimming is permitted in Lake Absegami while lifeguards are on duty. Please check our swimming schedule prior to your visit. Visitors will find a beach complex containing changing area, restrooms, showers, a first-aid station and a concession building offering refreshments, novelties and beach supplies. Inner tubes, rafts and other flotation devices are not permitted in the swimming area. Only Coast Guard approved life jackets are permitted. Pets are prohibited on the beach. 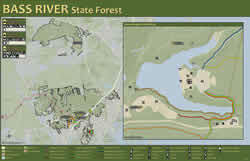 The Division's State Forestry Services has published a comprehensive Forest Resource Management Plan for Bass River State Forest to improve the long-term forest management practices and resource protection needs of Bass River. For a copy, please call (609)292-2531. Can I have a fire? You will receive the fire regulations upon arrival. Check-in and checkout times? Campsites and Group Campsites check-in is 12pm and checkout is 12pm. Lean-tos, shelters and cabins check-in at 4pm and checkout at 12 pm. How much is it for the day-use area? $5 per vehicle on weekdays, $10 on holidays and weekends. Buses need to make a reservation. Please call the office for details.